WASHINGTON -- Employers added a healthy 255,000 jobs last month, a sign of confidence amid sluggish growth that points to a resilient U.S. economy. 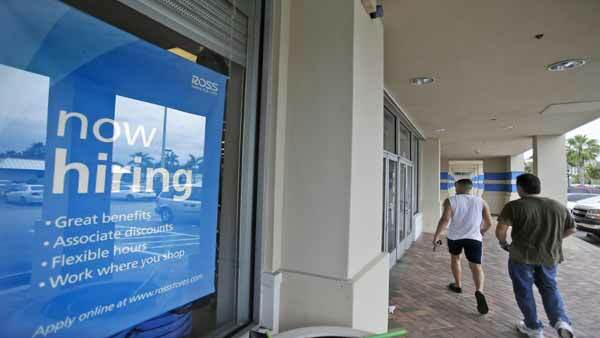 The Labor Department said Friday that the unemployment rate remained a low 4.9 percent in July. More Americans launched job searches, and nearly all were hired. But the influx of job seekers meant that the number of unemployed fell only slightly. The figures suggest that U.S. employers shook off concerns about Britain's late-June vote to quit the European Union. Nor were they apparently discouraged by tepid growth in the first half of the year of just 1 percent at an annual rate. Average hourly pay picked up and is 2.6 percent higher than it was a year ago, matching the fastest pace since the recession. July's robust job gain may be enough to reassure investors - and perhaps Federal Reserve policymakers - that the economy will keep growing at a slow but steady pace. The economy slumped in the first half of this year, with an annualized growth rate of just 1 percent. Growth has been driven by consumers, who ramped up spending in the April-June quarter at the second-fastest pace since the recession. That figure underscored the importance of strong hiring, which puts more paychecks into more pockets and supports greater spending. Many analysts expect the economy to rebound in the second half of the year, with one of the most optimistic estimates coming from the Federal Reserve Bank of Atlanta: It predicts that annualized growth will reach 3.7 percent in the current July-September quarter. Overall, most recent economic data have been mixed. Americans are confident enough to step up home purchases, aided by near-record-low mortgage rates. Sales of existing homes reached a nine-year high in June, and sales of new homes accelerated to an eight-year high.